Brysdales have been established for over 30 years. And with the advantage of an extensive and secure business infrastructure we are equipped to deliver the best and most cost effective solutions whatever the requirements. Increasingly we find ourselves working with our customers, assisting as they refocus, expand or downsize in response to changing circumstances. We help maximize their potential workspace by designing storage systems which optimise its use and which provide the flexibility to adapt to future needs so avoiding expensive relocation costs. 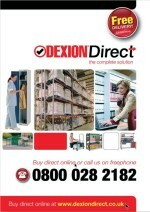 As an accredited Dexion Center, Brysdales bring the benefits of the backing of the brand leader in the supply of storage and materials handling systems. On-going research and consolidation by Dexion at an international level ensures the availability of competitively priced products, which provide the right solutions for today’s demanding and dynamic markets. To learn more about Brysdales, please visit our website.